It continues, the epic chat between Ken and John Kreng and for the final 90 minutes we go over some minor tidbits about John’s upcoming movie projects, he looks back at writing his book Fight Choreography: The Art of Non-Verbal Dialogue , there’s a detailed take on the impact of action directing in the West and how it’s used as storytelling. Tales of glass from Police Story is also provided before it’s time for ‘Make Ken Watch A Film’. It’s Sword Of Doom-time and the duo touches upon Japanese influence reaching Hong Kong and the anti-samurai stance of some classics. Finally, a PSA directed towards Stoo is included. Contact the show via email at podcastonfire at googlemail.com, via our forum (containing EXCLUSIVE content and announcements! ), Facebook or Twitter (@podcastonfire, @sogoodreviews). Music courtesy of Brian Kirby (http://briankirby.net) whose awesome clothing line you can find at http://www.shelflifeclothing.com/. 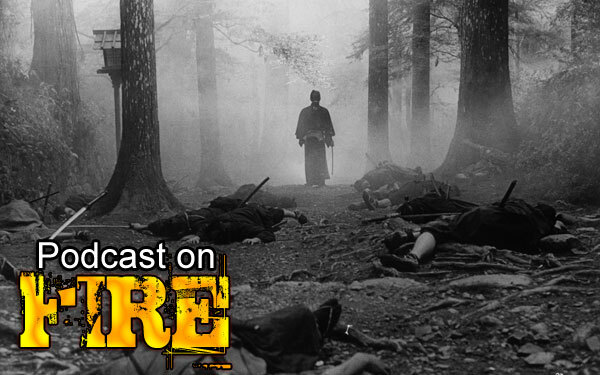 Suggest movies for Ken via our forum topic, Facebook, Twitter (@podcastonfire, @sogoodreviews) or Formspring. 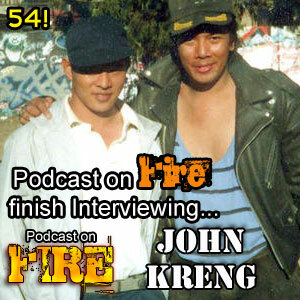 Catching up with author, stunt Coordinator, fight Coordinator, actor, professional stand up-comedian, action film historian and friend of the show John Kreng, the chat went on for 3 hours and this first part contains only the network updates if you can believe that. Jumping from topic to topic, Ken and John touch upon persons and subjects such as Lam Ching-Ying, old 3D Hong Kong movies, Commentary On Fire plans, Sammo Hung, Yuen Biao’s dispute with Ronny Yu and the difficulty Hong Kong filmmakers faces when working in the West. Plus a of EXCLUSIVE new shows on the network-announcements! We’ve reached another pivotal point in Jackie’s career, the 90s, and the decade that would define his worldwide status to a HUGE degree. Featuring a focus on specifically Drunken Master II and Rumble In The Bronx, Stoo and Ken are also joined by action actor, fight choreographer and action director Chris Jones (http://www.chrisjonesaction.co.uk/) throughout the show. 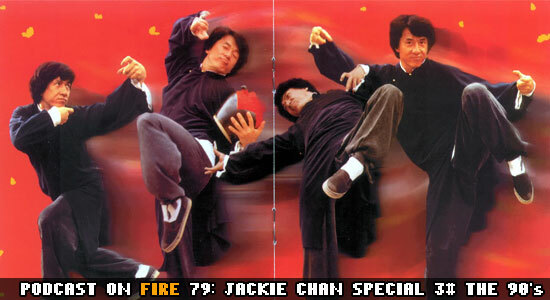 Also interspersed into various parts of the show are contributions from fellow podcasts VCinema, East Screen/West Screen, Joey Leung of Terracotta Distribution plus past guests Brian Kirby (http://www.briankirby.net/) and author John Kreng who all share their thoughts on favourite Jackie Chan movie of the 90s. 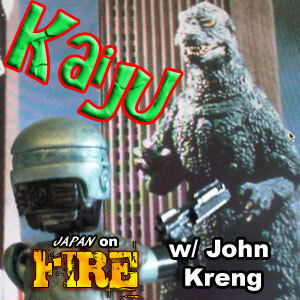 Fight choreographer and author John Kreng drops by in the conclusion to our Kaiju-themed Japan On Fire. A laid back chat between him and Ken covers a bit of the technical side to the action in the monster movies, John’s love for 70s grindhouse, B-movies, what makes martial acting and why not discuss a bit of RoboCop while we’re also at it. KEN’S EDIT:Excuse my misidentification of who does the stunt in No Regret, No Return. It’s apparently Sam Wong (who fought Jackie at the beginning of Police Story III). 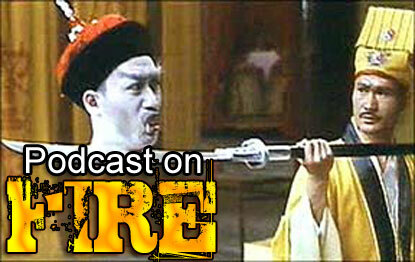 Coming up on the mighty Podcast On Fire, Ken confesses he knows TOO much about filthy Hong Kong cinema, Stoo is too stupid to get the love for French cinema evident in Johnnie To’s Sparrow and we pay our respect to late cult hero of the Hong Kong cinema screens, Shing Fui-on Also featuring the second part of Stoo’s marvellous interview with John Kreng that offers up among other things his defense of The Master, why it took so long to release and the respective takes on action choreography when done in East vs. the West.